Dental emergencies may come uninvited at any time of the day. Be it in the middle of the night, during an important occasion or on weekends when normal dental clinics are closed. Moreover, one needs to be extra careful about children and senior citizens of the household, as they are more susceptible to sudden dental injuries. In such cases, waiting till the next morning is never a feasible option. Delaying such mishaps is out of the question, which is why you need to consult an emergency dentist near you. Emergency dental clinics and dentists are the answer to your prayers when it comes to such critical situations, as they remain open 24/7 just to cater to your dental emergencies. Also, for office goes who cannot find the time to go to the dentist on the weekdays can drop in at an emergency dental clinic on weekends for a quick checkup. 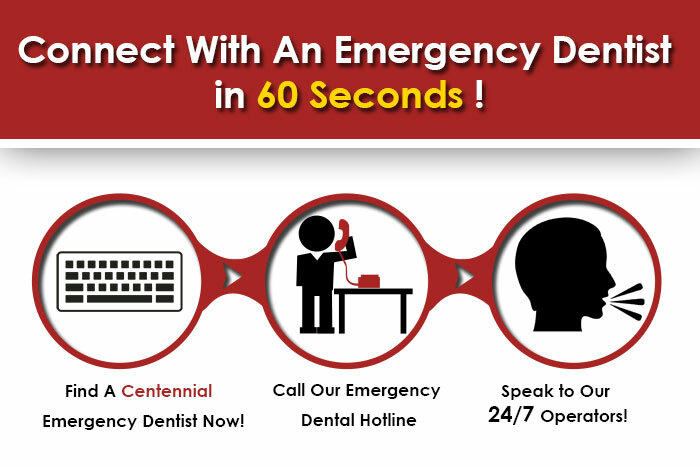 Therefore, it is best to keep some contact details of emergency dentists handy in case of immediate need. Listed as the 15th safest city in the United States, the City of Centennial is a Home Rule Municipality whose population is around 100,377. This large population also makes it the 10th most populous municipality in Colorado. Thankfully, there are many emergency dentists to cater to your dental emergencies in this city. The following is a list of emergency dentists and dental clinics for the residents of Centennial. Dr. Daniel Norrie is a cosmetic and restorative dentist in Southeast Aurora and Centennial. This family friendly clinic boasts dental staff known for their compassion and positive attitude. They provide special care in teeth whitening, veneers, dental implants, crowns and bridges, root canal therapy, etc. Located at 18525 E Smoky Hill Rd, you can call their number 303-617-9090 today if you have an emergency. Dr. Riesselman Phillip specializes in cosmetic and family dentistry. This U.S.C trained dentist has years of experience in a wide range of dental services, restorative care, and cosmetic treatments. It is located at 6262 S Parker Rd #300. Call them today for more information, to book an appointment, or during emergencies at 303-690-4500. Dr. Kyle Ricks and Dr. Landon Blatter are dental restorative experts in treating patients of all ages with a calming presence and a gentle touch. Aspen Springs Dental provides a wide range of affordable and expert oral care services for the entire family. The location of this clinic is at 7940 S University Blvd. You can call at 720-441-4857 to book an appointment.